When farmers in McCracken County, Ky., need help identifying a crop-eating pest or fencing in a herd of miniature horses, they call Doug Wilson. Wilson, 68, the county's agricultural extension agent, has spent the last two decades offering advice with the personal touch of an old-fashioned country doctor. He's gone to court seven times, for example, to sit with McCracken County growers facing bankruptcy. But these days, it's Wilson who is seeking advice, as he tries to help his county's agriculture sector wrestle with one of its emerging problems: climate change. The big picture. 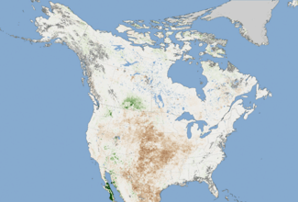 Satellite images taken in August show brown areas where plant growth was below that of normal years. Farmers and ranchers are among the chief victims of the record-breaking drought of 2012, which still sprawls over 54 percent of the United States (see related story). Click the map for a larger version. Photo courtesy of NASA. A new crop of opinion polls suggests many U.S. farmers believe the climate is changing, but few lay the blame on man-made greenhouse gas emissions. Fewer still favor policies to cut greenhouse gas emissions. And many are turned off by even the mention of "climate change," which they consider a highly politicized phrase. A February survey of 4,778 farmers across the nation's Corn Belt found that while roughly two-thirds believe the climate is changing, just 8 percent believe human activities are the primary cause. Preliminary results from a similar poll conducted in Mississippi, North Carolina, Texas and Wisconsin in 2009 show 40 to 50 percent of commercial farmers in those states don't believe climate change has been scientifically proved, while roughly 70 percent believe climate shifts will have little effect on crop yields. Even in tiny Yolo County, Calif., a solidly Democratic outpost in a blue state, just 35.2 percent of 162 farmers surveyed by researchers at the University of California, Davis, agreed that human activities are "an important cause" of climate change. And respondents were equally divided when asked whether climate change would benefit or harm agriculture on a global scale. Perhaps unsurprisingly, polls also show few growers are willing to accept measures designed to combat climate change. "Talking about mitigation is likely a non-starter with 60 percent of farmers," said J. Gordon Arbuckle Jr., an Iowa State sociology professor who conducted the Corn Belt poll. "That is one thing I've been talking about with my extension colleagues. And that's a key finding out of this study." It's a conclusion that sounds right to Wilson. "Most of the farmers will admit that climate change is happening," he said of the growers he advises in western Kentucky, on the Corn Belt's eastern fringe. "What they don't want to hear is that it's global warming induced by man's activities. In their mind, if we say, 'Yes, we think climate change is real. Yes, we think global warming is happening,' then someone is going to say, 'You are a big cause of it. You use fertilizers and chemicals and big tractors, and we're going to regulate you.'" And that means that simply throwing more information at farmers isn't the answer for scientists and others who want to start a productive conversation about climate change and agriculture, experts said. Paul Vincelli, a professor of plant pathology at the University of Kentucky's agricultural extension, learned that lesson the hard way. As part of the school's working group on climate change and agriculture, he prepared a dense handout packed with scientific facts and figures that "provoked a little blowback" from farmers, he said. These days, he's trying a different line when he speaks about climate change with county extension agents and farmers: "I tell them this is not something you've caused -- we've all caused it." Like many agriculture experts working on climate change issues, Vincelli believes farmers are much more receptive to aid intended to help them adapt to environmental shifts, whether it's developing new drought-tolerant strains of corn or wheat or adopting more efficient irrigation practices. "Mitigation is not yet really something our society wants to talk about, and that's reflected in our farmers," he said. Many adaptation practices, like those that reduce water or energy use, can provide immediate benefits to farmers' bottom line and broader climate benefits to society. Those short-term gains can make adaptive policies attractive to farmers who aren't sure whether climate change is real -- or if it's real, whether it will affect them directly. "One of the things that was most surprising was that even the people who thought climate change was happening globally weren't sure they had any real perception it was happening locally," said Louise Jackson, a plant scientist at UC Davis who surveyed farmers in surrounding Yolo County. "They would say things like, 'We know glaciers are melting, but we're not sure anything's happening here.'" But the farmers Jackson contacted did express concern about water availability, a problem they didn't link to climate change despite research suggesting California's agriculture industry will face reduced water supplies and higher temperatures in coming decades. "Water is a big issue for agriculture here and has been for a long time," said Meredith Niles, a UC Davis doctoral student who helped conduct the Yolo County polling. "If farmers we surveyed thought water availability had decreased over time, they were more likely to adopt positive behaviors for adaptation and mitigation." Similarly, the recent survey of farmers in 11 Corn Belt states showed drought was the impact of climate change they feared most. "We asked farmers to rate their level of concern about a number of climate-related issues," said Arbuckle, the Iowa State sociologist. "If you add up 'concerned' and 'very concerned' responses, drought was by far the No. 1 concern -- and that was before this drought. We haven't had a major drought in Iowa since 1988." Still, it's not clear whether the ongoing, widespread drought in the nation's heartland and other recent extreme weather will help shift farmers' attitudes. Climate scientists expect many types of weather extremes to become more frequent, more intense or both as man-made greenhouse gases build up in the atmosphere. The federal government's U.S. Climate Extremes Index, a measure of the frequency and severity of extreme weather, set a record high last year, the peak of a steady upward climb that began in the early 1990s. "Drought is the scariest thing for a farmer," Arbuckle said. "The thought that these things could become more frequent really freaks Corn Belt farmers out. I wouldn't be surprised if some minds across the Corn Belt were changed this summer." One recent national poll suggests the general public is starting to link weather extremes to climate change. The majority of the 1,008 adults who responded to the survey by researchers at Yale and George Mason universities said they believed climate change had an effect on the warm winter of 2011 (72 percent) and helped produce last year's Texas drought (69 percent) and Mississippi River flooding (63 percent). But it's not a given that the shift in attitudes will persist if weather extremes ebb. Older polls suggest people are more apt to believe in climate change when conditions are warm, and their certainty cools along with the weather. In western Kentucky, the summer's dry heat has at least prompted some growers to rethink the way they plant their crops. In the 1950s, when Wilson was a boy, the region's farmers sowed about 22,000 corn kernels per acre. Over the years, that number has crept up. Now some growers plant more then 30,000 kernels per acre in the hope of raising dense thickets of corn plants, a strategy that can backfire during years when water is scarce. That includes this summer. For most of July and August, McCracken County experienced "exceptional drought" -- the most severe category according to the National Drought Monitor -- and crops suffered. However, farmers and extension staff noticed that many stalks growing next to "skips" -- empty patches where plants didn't take root -- were able to produce healthy ears of corn despite the hot, dry conditions. Plants in denser rows weren't as vigorous. "I've got 220 acres that a guy rents from me," Wilson said. "I just asked him, 'Have you given any consideration to dropping the populations back on these hills?' He said, 'We always did, but we might need to do this a little more.'" That kind of flexibility is crucial in the face of change, whether it's the climate or the rapid urbanization that is consuming 1,000 acres of McCracken County farmland each year, Wilson said. While adaptation may be a buzzword for people who study climate change or craft government policy, it's a survival strategy for growers. "Farming is a business," Wilson said. "It's portrayed as a way of life, and there is a lot of nostalgia to this, but if you don't treat it like a business, you may not enjoy that way of life very long. Our younger farmers are better at looking at it as a business than our older farmers did."